As you may well know, the number of hedgehogs in britain has declined alarmingly. What’s causing it is not really known but I’m sure the unseasonal weather in recent years is at the root of it. At any rate, we, as the top monkeys on this planet have the duty to try and help our less capable cohabitants. 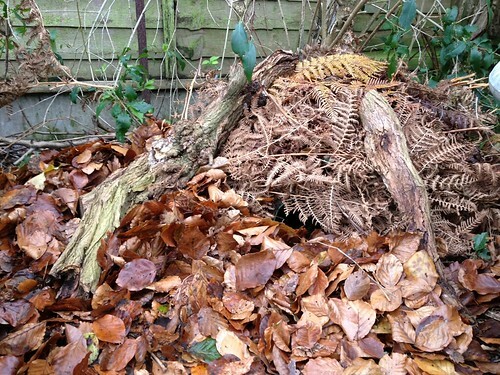 In this respect, last year I bought a Hogitat Hedgehog House to provide a place for the hibernating hogs. 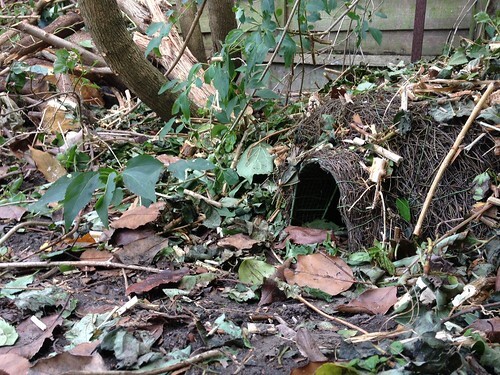 Although similar hedgehog homes can be made at home (and I plan to make one myself next year), at the time I wanted a quick and easy solution. It promptly arived from the online store I bought it from and I sited it in a sheltered position facing south-east, away from the prevailing westerly winds and the freezing northerlies. I made sure it had some overhead cover and left it over winter. Unfortunately the hedgehogs decided being neighbours with me was a bit beneath them and decided to not move in that year. However, earlier this year I was mowing the lawn and a frog had it in his mind to take refuge in there. It looked as if he had done so before as there was no thought involved, he just went for it. Another autumn has come upon us and I thought I might make the hogitat a little more appealing to the seemingly more discerning hedgehogs. I decided to make a trip to the New Forest and collect some dry bracken and some fallen leaves. Armed with my mother (for her packhorse-like abilities), I plundered Oakley Inclosure. Now even though I say so myself, this little home looks warm and cosy and I’m sure a hedgehog would be proud to have his mail forwarded to there. If I were a little smaller in stature, I might even be tempted to move in myself. Disclaimer: I apologise for any tweeness in this blog post but claim no responsibility for any resulting ill health.